I used to think that a certain famous saying was about a gnome called Anne who was tied to a large rock by a wicked witch and then freed from the ropes by Father Time…hence ‘time untied weight for gnome Anne’, but it turns out that it is actually “time and tide wait for no man” and that awful pun-laden introduction is my way of broaching the subject of the advancement of years and the recognition of one’s mortality. 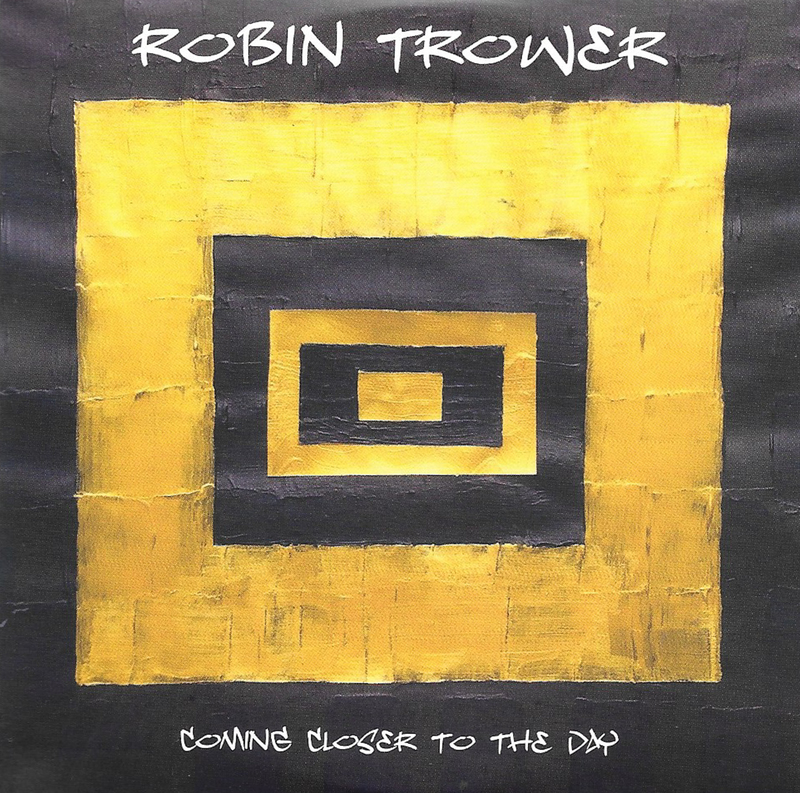 The genius that is Robin Trower has done just that with his latest album, Coming Closer To The Day, as he acknowledges he has reached his eighth decade and that, in his own words, he “is nearer the end than the beginning…if I went tomorrow, I’d feel blessed with being able to achieve an incredible amount as a musician”. Well, as far as I am concerned sir, you most certainly have. Back in 1974 I had already begun to look to the blues and their influence on the rock music I already loved; I was also ‘into’ Hendrix and the blues he brought to his fiery table…then came an album featuring a guitarist that the press, unjustly it turned out, suggested was a clone of Hendrix called Robin Trower. That piqued my interest sufficiently and so I bought the album and totally disagreed with the press; this was original blues based rock of the highest order without sounding like anyone but Trower. That album was Bridge of Sighs…named after a racehorse rather than the Venetian canal crossing or, indeed, the Cambridge river crossing. Although a lot of his subsequent work didn’t scale the heights that this achieved, all of his output is quality stuff: I never did get into his previous band, Procol Harem where Robin plied his trade before taking control of his own destiny. With the release of this new one, he has achieved yet again, a solid album of blues laced with the R’n’B feel of his early years. OK, vocally he isn’t James Dewar and I do still miss his gravelly tones but Trower handles the vocals well enough to keep the soulful blues feel we know and love and, as with a couple of previous albums Robin handles bass duties too. Opener, Diving Bell, shows that he has lost none of those essential qualities…timing and the ability to leave spaces: to wrench emotion from every string and communicate it effectively to the listener. The signature Stratocaster he uses has a superb tone and when he stokes the strings throughout this song, it makes you melt into every note. The wah is tastefully deployed along with distinctive tremolo and it all combines to form guitar man’s bliss. Truth or Lies is next and has a slightly faster backline which Trower plays some exquisite phrases across as it builds to a solo of the honest kind…each note means something and he doesn’t care if you can hear the fingers moving on the wound strings. The title track is the most Bridge of Sighs in its structure and echoed chords, but it very different and the solo again shows how to use a few notes and still sound complete. The lyrics are better defined here and do tell a story of mortality that remind us all that time is passing…the darkness those lyrics suggest is alleviated by the simply superb playing. Ghosts is the longest track on the album and benefits from the extra time and space as we get to enjoy those tones, chords and feel in greater depth allowing the full majesty of his playing to envelop and transport with the way the guitar adds meaning and nuances you didn’t know were possible: the solo could last forever and it would still be over too soon. It is also the most obvious blues based song with the riff, such as it is, and the bass and drums utilizing a recognizable pattern. Lovely! Tide Of Confusion is next its intro and chord work behind the soulful vocals is enthralling and the solo is electrifying in every sense of the word. The Perfect Wrong has a riff that makes me think the lovechild of Manny Charlton and Jimi Hendrix had a hand in it…it has a weight behind its essentially simple base and the wah punctuations are great. Then, guess what? The solo is brilliant; a lesson in how to wah and, it’s too short! Little Girl Blue surprises as Trower delivers a jazz based ballad with such simplicity and yet it still fascinates with the sparse and effective chords behind the vocals. The solo is delicate, clever and shiver inducing. The brilliantly titled Someone of Great Renown opens with great bass, lead chords and drums as it builds to a perfect blues for a late night and lying back and reveling in the sound of a man and his guitar totally at ease with himself and the world. This is where my review copy differs from the full release and why I have already ordered the CD…my last track is a foreshortened Lonesome Road (and the last three tracks are absent) and the minute and a half serve to whet an appetite for more. It’s a blues master class in guitar playing…as is the whole album. If you’re new to Mr Trower, you may feel that this is an album full of similarly paced songs that don’t set the world alight…I would counsel that you listen (and I mean listen) carefully and then you will appreciate the countless nuances and touches that he brings to the blues guitar. If you’re already a fan, then you will be in seventh heaven. Studio 91 in Newbury, with engineer Sam Winfield.